American classics served up hot & fresh right in the heart of Main Street USA! 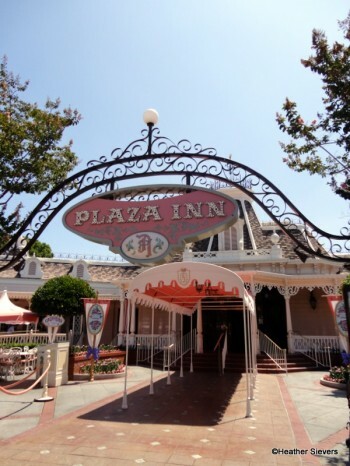 During lunch and dinner hours the Plaza Inn serves as a cafeteria-style eatery with rich Victoria atmosphere and plenty of indoor seating, while breakfast is a character meal experience. Pot roast served with vegetables, mashed potatoes, gravy & a biscuit; Penne pasta; Plaza Inn Specialty Chicken (fried chicken) served with mashed potatoes, vegetables, & a buttermilk biscuit; house salad; Cobb salad; assorted desserts. Children have the choice of fried chicken or Penne pasta. A variety of soft drinks, hot cocoa, coffee, chocolate milk, apple juice, Power Ade, lemonade, and low-fat milk are also available. Important Info: Plaza Inn offs a character meal for breakfast only.